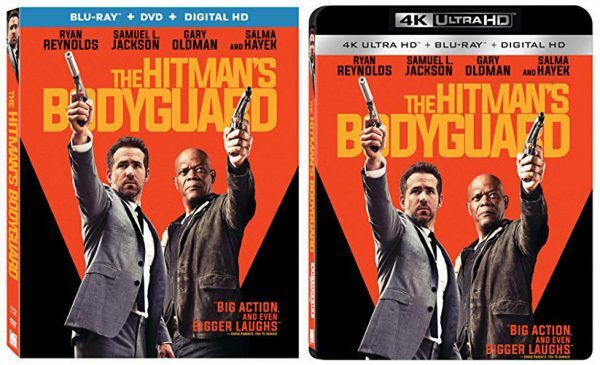 Director Patrick Hughes’ action/comedy The Hitman’s Bodyguard will release to Blu-ray, 4k Blu-ray, and DVD on Nov. 21. The Blu-ray editions from Lionsgate include plenty of extras such as outtakes, deleted, extended and alternate scenes, commentary, and several featurettes. As well as the extras, the 2-disc Blu-ray combo edition ($39.99 MSRP) includes a DVD and Digital Copy, while the Ultra HD Blu-ray combo edition ($42.99 MSRP) packs a Blu-ray and Digital Copy of the film. Pre-orders from Amazon can be purchased for $19.96 (Blu-ray) or $24.96 (4k Blu-ray). The Hitman’s Bodyguard had a small theatrical run back in August, grossing only $21B at the US box office. The film’s impressive cast includes Oscar-nominated actors Samuel L. Jackson, Salma Hayek and Gary Oldman, Golden Globe-nominated Ryan Reynolds, and The Defenders actress Elodie Yung.